Further, in recognition that the Wounded Hero often expresses deep concern for their buddies remaining on the front line, Operation Gratitude will send care packages on behalf of the Wounded Hero to the rest of his or her unit still deployed downrange. “We hope that sending those packages to their deployed comrades will help the wounded feel they are still contributing to the mission and supporting their buddies” according to Operation Gratitude founder, Carolyn Blashek. Wounded Warrior Transition Units (“WWTU”) provide critical support to the wounded and their families, focusing on those requiring six months or more of rehabilitative care and complex medical management. Operation Gratitude Purple Heart Care Package deliveries will begin in February. Patients at Bethesda National Naval Medical Center and soldiers in the WWTU at Ft. Polk, Louisiana will be among the first to receive the shipments. Operation Gratitude’s annual goal is to provide 10,000 of the Purple Heart Care Packages filled with specially selected items donated through the generosity of corporate sponsors and supportive citizens, and assembled by the organization’s dedicated volunteers. More packages will be assembled and shipped if requested. According to representatives at Wounded Warrior facilities, the most needed items are: Entertainment items, hygiene products, iPods and gift cards from chain stores such as supermarkets, drugstores, Target and Walmart. As with its care packages to deployed troops, Operation Gratitude will provide every American a way to express their appreciation and encouragement to our heroes wounded in combat by donating “Wish List” items, contributing funds, crafting hand-made items and writing letters. Operation Gratitude annually sends 200,000+ care packages to Veterans, First Responders, New Recruits, Wounded Heroes, their Care Givers, and to individually named U.S. service members deployed overseas and their families waiting at home. Each package is filled with food, entertainment, hygiene and hand-made items, as well as personal letters of support. Our mission is to lift the spirits and meet the evolving needs of the Military and First Responder communities, and provide volunteer opportunities for civilians anywhere in America to express their appreciation to all who serve our nation. Each package contains donated product valued between $45 and $100 and costs our organization $15 to assemble and ship. Since its inception in 2003, Operation Gratitude volunteers have shipped more than 1.6 Million Care Packages. This entry was posted in Uncategorized and tagged Army, Bethesda National Naval Medical Center, Brooke Army Medical Center, care packages, charity, community service, donate, donations, Ft. Polk, Marines, military, Military care packages, Military Hospitals, Military support, Operation GRatitude, Soldier and Family Assistance Center, Transition Units, veterans, volunteer, Wounded Warriors. Bookmark the permalink. GOD BLESS OUR TROOPS AND VETS. MY MOTHER AND FATHER MET IN VIETNAM 67-69. DAD IS CHIEF WARRANT OFFICER ARMY DUSTOFF MEDIVAC STEPHEN L TOOMOTH MOM IS ARMY CAPTAIN RN DIANA (DWAN) POOLE. 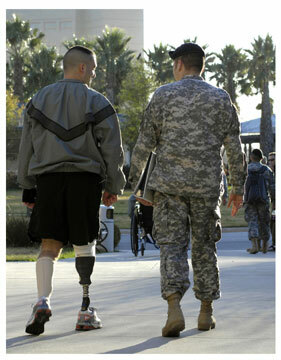 I HAVE A HEAVY HEART FOR OUR VETS. I DONT HAVE MUCH MONEY, BUT LOTS OF LOVE TO SHARE. CARDS TO ANY AND ALL SERVICE MEN AND WOMEN. AMEN. somewhere online I found bags to crochet for wheel chairs of wounded warriors but dont remember where. do u know size of bags and dirctions for making then where to send them? No — we don’t, but perhaps someone who reads this will know and share the information with us. Check http://www.pinterest.com or http://www.etsy.com. Either website may have crochet bag patterns for a small fee or for free. I think this is a great idea and I plan to support it!!! This is an excellent idea. I am sure my dentist clients and their patients will be on board as they have been with the Halloween Candy Buyback. We need to show the troops how thankful we are for what they continue to do to protect us. Our One Millionth Care Package Celebration!